Did you know that watering in fall is vital to the health of your trees and shrubs? Many people assume that because the weather is cooler in fall their plants no longer require water. In fact, trees and shrubs still use water during fall even if the weather is not as hot as the summer months. Many homeowners are surprised to know that fall has some of the least precipitation of the year in Calgary. So even know it is cooler fall watering is very important. Many landscaping companies are in a rush to blow out sprinkler systems in fall. They often blow out sprinklers and shut of sprinkler systems long before the first hard frost in October. Homeowner rely on the sprinkler companies experience so they don’t question this practice. September – November can be very dry months so wintering trees and shrubs will suffer greatly if they are not watered during this time. IF your sprinkler system is shut off, be sure to hand water your trees and shrubs right up until the first hard frost. Trees and shrubs go dormant during the winter months but even the process of dormancy requires energy and the plant needs water to help give it that energy. Trees and shrubs also use fall water in the early spring to provide them with the nutrients they need to come to life and create new buds, leaves, and flowers. 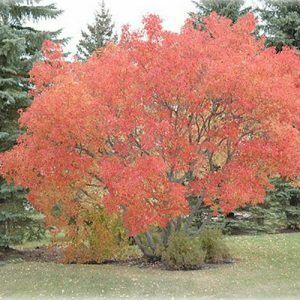 Be sure to water your trees and shrubs every 10 days or so in fall with a final heavy watering just be for the first hard frost. Calgary typically gets its first hard frost in late October.